In The Summertime, by Mungo Jerry one of the fastest selling singles of all time. It was recorded early in 1970 and within weeks, the record had become a global hit sending its composer, lead singer and front man, Ray Dorset aka Mungo Jerry into a completely different world from being a semi-pro musician to an overnight international star. Tracks: In The Summertime, Mighty Man/Dust Pneumonia Blues. Shortly before the release of In The Summertime, The Good Earth as they were then known placed an advert in the music press looking for more work. The ad was seen by promoter/producer Barry Murray who had worked with Ray Dorset previously and was looking to contact him again. This contact eventually resulted in the band’s first big break, when they were signed to PYE Records by Murray, who had taken over as in-house producer and talent spotter for the company. PYE had set up their own progressive label Dawn as their answer to similar such labels as Harvest & Vertigo. They spent some time in the recording studio at the dead of night after gigs performing their entire songbook. Enough tracks were recorded for an LP with some more songs left over to release at least one single. To take advantage of this Barry devised a way to launch the label – the 33 1/3 r.p.m maxi-single, which would basically be like an E.P containing 3-4 tracks, but played at the slower speed, presented in a picture sleeve and to sell for just slightly more than a standard 45. His new charges would be the first band to release a record in this format. At the label’s request, the band underwent a final name change. 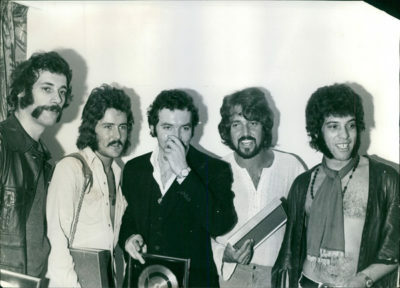 The Good Earth had now become Mungo Jerry (named after a character in T.S Eliot’s ‘Book Of Practical Cats’), and (at Barry Murray’s insistence, and rightly so), the decision was made to release a Ray Dorset composition, the infectious and philosophical celebration of life, In The Summertime as the lead track on their debut (maxi) single. It would be backed by another Dorset number, the riotous Mighty Man and a version of Woody Guthrie’s, Dust Pneumonia Blues. The band had wanted Mighty Man as the single but Murray had his way. It had an astonishing impact on the music world. It raced to number one just a fortnight after its May 1970 release, remained there for an impressive seven weeks and became the year’s best selling single. The band were suddenly in demand all over the world and appearing on countless television and radio shows. It topped the charts in over 20 countries and in France, became the fastest selling single ever. In the UK, PYE sold 73,000 copies of the record before lunchtime in one day. To date, including inclusion on compilation albums, the song has clocked up global sales in excess of 30 million. The day after the single’s release, on Saturday 23rd May, the band turned in a breathtaking performance at the HOLLYWOOD MUSIC FESTIVAL – ,not Hollywood in California, but much closer to home with the festival site located near Newcastle Under-Lyme. The festival had been organised by their management company, Red Bus. Acts included, Black Sabbath, Traffic, Free, Jose Feliciano and making their first UK appearance the Grateful Dead. 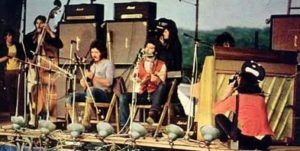 Following acts including the popular Family on stage, Mungo Jerry with their irregular, drummer-less line-up of guitars, banjo, piano, double bass and washboard gave the performance of their lives! They did so well, they were asked to make another unscheduled appearance the following day. Ray Dorset, who was initially worried about this second appearance, as they were on stage directly after Free, in the charts with Alright Now, who then played a well received set. But fear not, Mungo Jerry performed to the same scenes of hysteria as on the previous day. Soon after, the music press screamed their approval with their headlines of – MUNGOMANIA and MUNGO JERRY FEVER! “My Grandma bought me Mungo Jerry’s, In The Summertime, and man I still love that song. I saw the video they did and the chops on that guy, wow! It’s a great tune, it really is a great tune. Everything about it is like what the hell were these people on”. Tom Yorke, Radiohead, June 2017. “The first song I ever learned to play, and the first song I ever performed publicly (at a ‘skool’ lunchtime concert in Edinburgh when I was 12 years old) was In The Summertime”. Mike Scott, The Waterboys, June 2017. 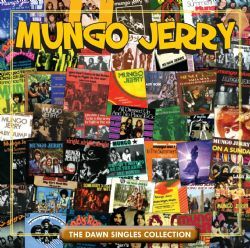 OK, if Mungo Jerry must suffer the vagaries of categorisation then I’ll define them – rock, blues, country, jug, jazz. Yeah sure, these are the sounds that colour their music, but it all comes out fresh and original and you must see them to believe it. The biggest selling cover version of In The Summertime was recorded by Shaggy in 1995. Like the original it was a worldwide hit. This version also included samples of Ray Dorset’s vocal and guitar. Shaggy’s version made it to the number one spot in the U.S.A the only major record selling territory that the Mungo Jerry version didn’t, where it stalled at the number three spot in the Billboard chart. For years Bob Dylan used In The Summertime in sound checks at gigs where his rendition of the timeless classic often lasted over ten minutes. Billy Idol and Slash joined forces with ex Dream Theater keyboard wizard, Derek Sherinian to record and video IN THE SUMMERTIME for his 2006 CD Blood Of The Snake. Sherinian confirmed that In The Summertime was his favourite song from his childhood and one he had always wanted to record. This was a rousing grunge version of the song that certainly grabbed your attention with a video to match. Elton John in his days as an out of work hungry musician covered In The Summertime for the budget label Hallmark, as a track on one of their Top Of The Pops compilation LP’s. The Ivor Novello awards represent the pinnacle of musical achievement and peer recognition in the music industry. Ray Dorset received two of these awards for the highest certified British sales and the International hit of the year by a British writer in 1970 as the composer of In The Summertime. John Van Der Kiste, A & F Publications, 1990. Destined to be one of the biggest for summer ’70, the aptly named In The Summertime. A piece of rock/blues/country/jug/jazz and the most original sound I’ve heard for a year. It’s on a maxi-single from Mungo Jerry, the most devil-may-care music since Lovin’ Spoonful. Just watch this one move. If you’re looking for value for money, try the new maxi-single. Pye’s Dawn label introduces it; a 7-inch 33 1/3rd stereo disc selling at 9s 11d. In the Summertime UK sheet music. Mike Nevard, The Sun, 25th May, 1970. One of the first two maxi-singles released by Pye on their own Dawn label. Roughly eight minutes per side in stereo plus fancy sleeve for 9s 11d. 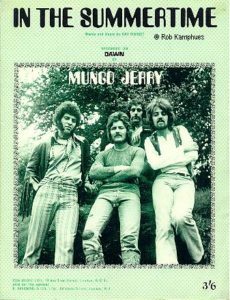 Mungo Jerry make a great sound incorporating, as the sleeve notes claim, everything from rock to jug. Their version of Woody Guthrie’s Dust Pneumonia Blues is a right rave-up with a tremendous barrelhouse piano and harmonica backing. Daily Mail, 23rd May, 1970. A good try from a cheerful jug and boogie band. Unfortunately they tend to sound amateurish. The songs nagging commerciality resulted in a runaway smash. The reason for this mass outbreak of musical madness was not Marc Bolan though. It was Mungo Jerry’s In The Summertime , a sunny, seasonal hit, maddeningly infectious. “What really made Marc a star was Mungo Jerry not Marc Bolan” claims Simon Napier-Bell. “When Ray Dorset arrived with his voice and put it into a super-commercial hit song, suddenly that voice was acceptable”. Marc Bolan played it cool. “I suppose he could have been copying an old blues singer for all anyone knew”. Mark Payress, Omnibus Press, 2002. 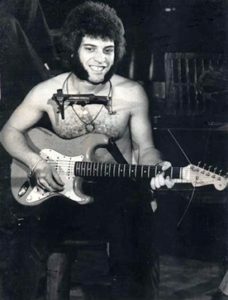 Mungo Jerry’s charismatic frontman and songwriter, Ray Dorset, was still working in a Timex factory when their sun drenched jug-band anthem, In The Summertime took the charts by storm. “I had to ask my boss for the afternoon off to do Top Of The Pops”, he recalled. Virtually unknown, they had been the surprise smash of the UK’s Hollywood Music Festival, outshining headliners including the Grateful Dead and Black Sabbath. Four days later the song entered the UK Top 20, reaching number one on 13th June 1970. Undeniably a classic slab of good-time rock, In The Summertime’s live ‘rootsy’ down-home, banjo-driven vibe provided welcome relief from the era’s sophisticated prog-rock and manufactured pop. Sean Egan, Octopus Books, 2007. We now have Diary pages covering Mungo Jerry’s gigs and news stories, old fan club info, press cuttings and memorabilia starting with 1970, and the section is now complete, taking it up to the present day. Ray Dorset aka Mungo Jerry continues touring and recording critically acclaimed albums such as Adults Only (’03), Naked From The Heart (’07), Cool Jesus (’11), the double albums, Rewind (’16) and 100% Live (’17). …enjoy the MUNGO JERRY MAGIC!